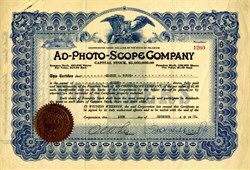 Beautifully engraved certificate from the Ad-Photo-Scope Company - 1921 This historic document was printed by the American Banknote Company and has an ornate border around it with an image on the verso of a Ad-Photo-Scope machine. This item has the signatures of the Company's President, F.H. Hibbard and Secretary, O. W. Lee. The business of the Ad-Photoscope Company is the manufacture and marketing of the Ad-Photoscope machine, which is an automatic continuous moving picture projector for use in advertising and educational campaigns. We understand that it can be used in store windows, waiting rooms, school rooms, etc. and does not require an operator because it can be attached to an ordinary electric light socket. We understand that the company has no more stock for sale, having disposed of whatever it desired to sell to individuals or brokers, and that the management is regarded as completely financed. The company is regarded as a legitimate proposition. F. H. Hihbard, its vice president, is well spoken of, and the company is understood to be handled in a business-like manner. Of course, the stock is a speculation, much depending upon whether or not as large a demand for the output of the company is realized as its officers appear to expect.